Who doesn’t love a good falafel? Crispy and crunchy on the outside, tender and flavorful on the inside. These kale falafels add a healthy twist to this Mediterranean/Middle Eastern treat without sacrificing that classic flavor! They’re perfect for dipping in homemade hummus or tzatziki, or even making some amazing falafel buddha bowls! Rinse and drain the dry chickpeas. In a medium pot, add the chickpeas and cover with 1-2 inches of water. Bring to a boil, boil for 1-2 minutes, then remove from the heat and cover. Let sit for one hour. While chickpeas sit, wash and dry the fresh produce. Remove ribs from kale, and peel leaves off cilantro and parsley. Halve lemon. Peel and roughly chop onion. Drain chickpeas and add to food processor or high powered blender along with onion, parsley, cilantro, kale, garlic, tahini, and the juice from the lemon (you may need to work in two batches depending on the size of your container). Pulse/blend until mixture is roughly broken down and combined, mix in cumin, coriander or cardamom, cayenne, and salt and pepper to taste. Add chickpea flour 1 tbsp at a time as needed until you have a doughy consistency (if the dough is too moist your falafels will fall apart). Cover falafel dough and refrigerate for 30 mins to let firm* Using approximately 2 tbsp of dough per falafel, form the dough into discs. You should get around 20-24 falafels. The disc shape is important because it cooks more evenly in a pan than a ball shape. *refrigeration is optional, it just helps your falafels stay together while cooking. Heat a thin layer of oil (around 2 tbsp) in a large pan over medium-high heat. Use a high heat oil that is made of mostly healthy fats like avocado oil or sunflower oil. Once oil is hot, add falafels to pan and cook until golden brown and crispy, 3-5 minutes per side. Continue process, adding oil as needed until all falafels are cooked. Some recipes choose to bake the falafels as a healthier alternative to frying, but I haven’t been able to recreate that classic flavor and crunch with baking. Luckily frying doesn’t have to be unhealthy. Using just a thin layer of an oil with healthy fats like avocado oil and pan frying the falafel is what I’ve found to work best. You’re still able to get that crunchy golden brown texture on the outside, without soaking up a bunch of oil and saturated fat like you would from deep frying. 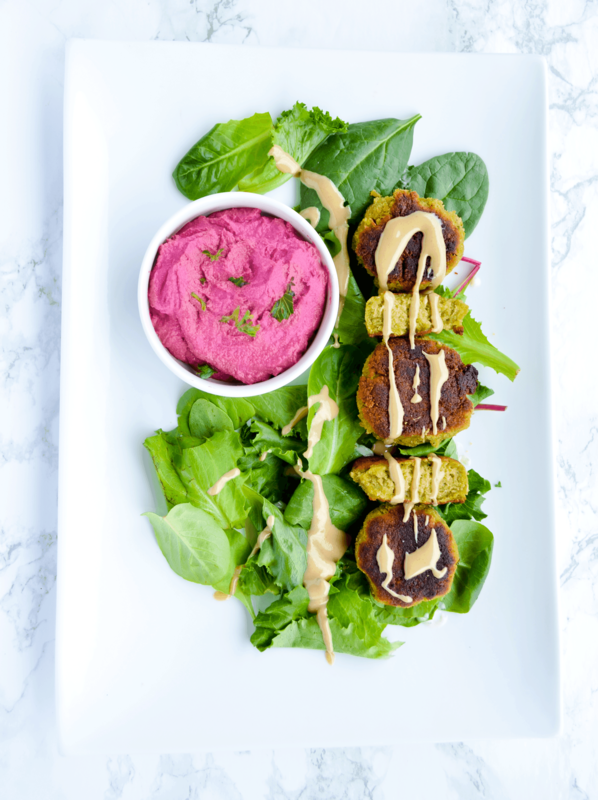 This falafel recipe is both vegan and gluten-free! If you’re not gluten-free, feel free to sub regular flour for the chickpea flour. If you don’t have tahini lying around you can use hulled sesame seeds instead! Use 4 tbsp of the sesame seeds and a drizzle of olive oil in place of the 2 tbsp of tahini. These vegan kale falafels are a crispy and delicious Mediterranean treat. Classic falafel flavor with an added nutritional boost from the kale! Perfect as an appetizer with some hummus or tzatziki, or as a side to any Mediterranean meal. In a medium pot, add dried chickpeas and cover with 2 inches of water. Bring to a boil, boil for 1-2 minutes, remove from the heat and cover. Let sit 1 hour. While chickpeas cook, prep the kale, onion, parsley, and cilantro. Once chickpeas are done cooking, drain excess water and add to a food processor or blender with onion, kale, parsley, cilantro, garlic, tahini, and lemon juice. Pulse/blend until broken down, then add cumin, cayenne, coriander, salt, and pepper and mix until well combined. Add chickpea flour 1 tbsp at a time while pulsing until the mixture reaches a dough consistency. Using approximately 2 tbsp scoops, form the falafel dough into discs. You should get around 20-24 falafels. Heat a thin coating of avocado oil in a pan over medium-high heat. Once the oil is hot, add falafels and cook until golden brown, about 3-5 minutes per side. Enjoy with some homemade vegan tzatziki or beet hummus! This recipe uses dried chickpeas instead of canned. Canned chickpeas are too soft and can make your falafels fall apart!